4/19 No to ALL Bombs in Syria! Let ALL the Refugees In! No to ALL Military Intervention! No to Assad! Let All the Refugees In! 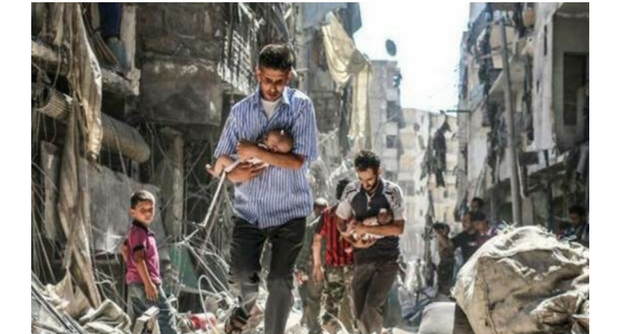 Trump's missile launches are the latest attack on the Syrian people, but Syrians have been suffering at the hands of the dictator Bashar al-Assad and U.S. and Russian imperialists for too long. As socialists, we stand with the Syrian people against dictatorship and imperialism, and we know that U.S. bombs won't liberate anyone. We say no to bombs, and yes to welcoming refugees! Join us for a talk and discussion as we consider the roots of the conflict and how we can support the Syrian people. Come join our very first revolutionary dance party! 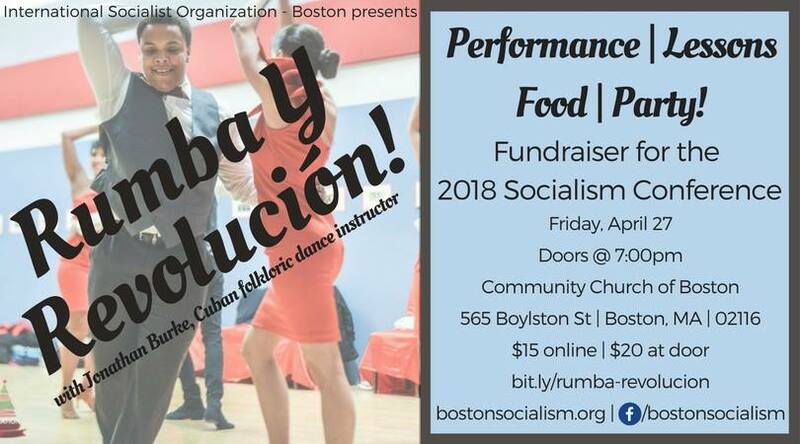 This fundraising event will feature a performance by Cuban folkloric dance instructor Jonathan Burke, dance lessons, food and, of course, a dance party! Buy tickets now: $15 online, $20 at the door. All proceeds will benefit the 2018 Socialism Conference (July 5-8 in Chicago), and provide sponsorship for those in the Boston area without the funds to cover their own registration, travel, and/or housing costs. #Socialism2018 is a four-day conference bringing together hundreds of socialists and radical activists from around the country to take part in discussions about Marxism, working-class history, and the debates and strategies for organizing today. Want to be a part of it? 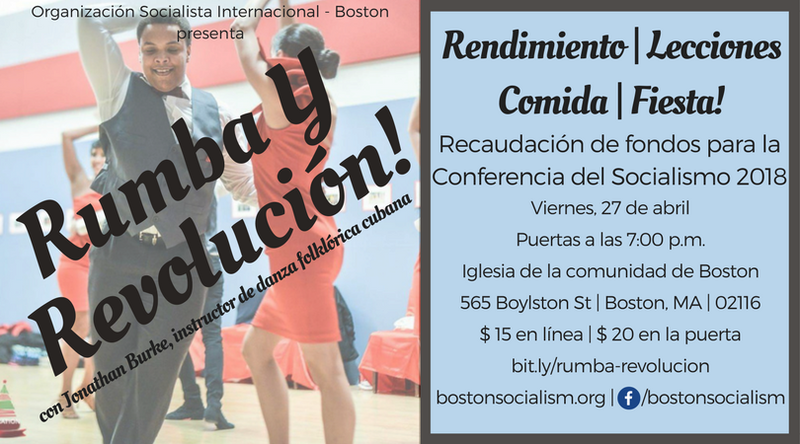 Register today athttps://socialismconference.org/! After a nine-day wildcat strike of over 20,000 people, West Virginia teachers won a huge victory: a 5% increase in wages not only for themselves, but for all state employees. In the process of forcing the legislature to meet their core demands, they built wide popular support and galvanized teachers, nurses, and other workers around the country to consider and plan strikes of their own. The strike has been one of the most major victories of the U.S. labor movement in recent history, as well as of the Trump era. What the West Virginia strike demonstrates is the immense power of working-class people in making huge gains toward the just, equitable world we want and need. As the Supreme Court nears a ruling on the Janus v. AFSCME case, West Virginia has proven what's possible for labor if we put up a fight. 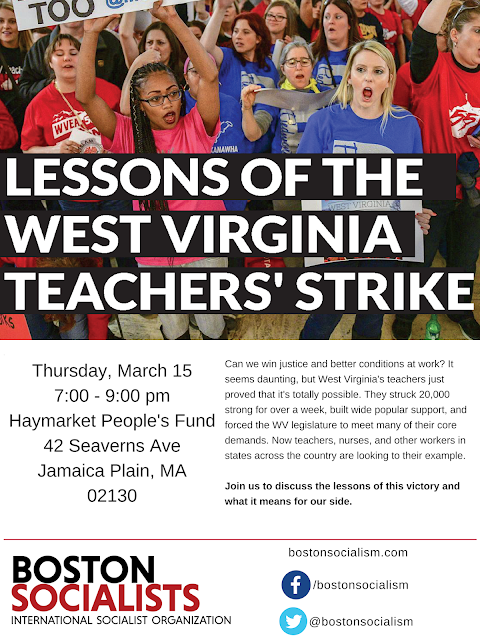 Join the Boston ISO to discuss the lessons of this victory and what it means for our side. ICE terror. The Muslim Ban. The border wall. The attack on Dreamers. The overhaul of the visa system. No matter where you look, the Trump administration is waging another brutal war on immigrant communities. Yet in cities across the country, people are fighting back, demanding sanctuary, amnesty, equality, and justice. 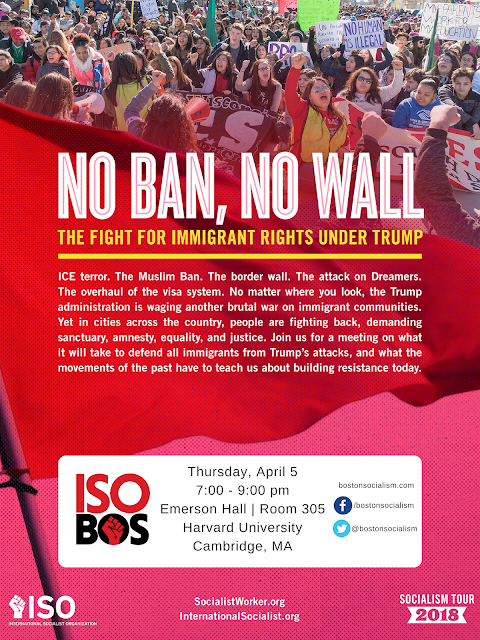 Join us for a meeting on what it will take to defend all immigrants from Trump’s attacks, and what the movements of the past have to teach us about building resistance today. This talk is part of the Socialism Tour 2018, bringing experienced activists and thinkers to cities across the country in the lead-up to this year’s Socialism Conference in Chicago. Register for the conference today! Another school shooting. Another killer with white supremacist motives. The NRA rejoices as gun sales go up. But high school students nationwide are building resistance from tragedy. 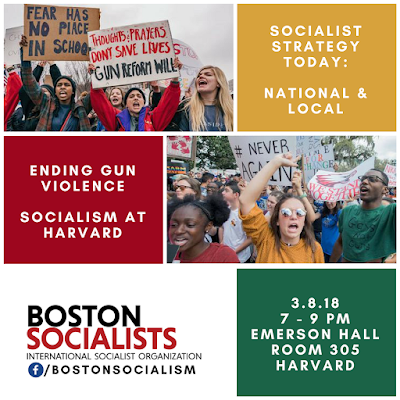 Join the Boston Socialists at Harvard University for a discussion on the new movement against gun violence and what socialists say about ending gun violence and fundamentalism.